Have a sweet tooth? 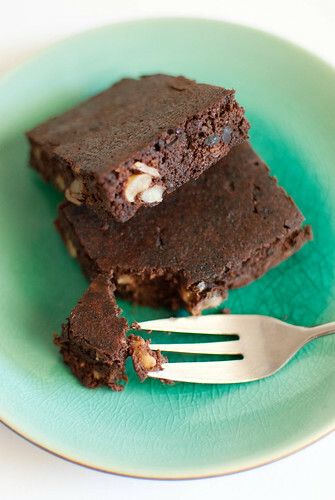 Try these healthy desserts! A year or two ago I came home to visit my family for a weekend away from college. I walked into the house and noticed a batch of brownies on top of the stove. This was rather uncharacteristic for my family. My dad, a marathon runner and triathlete, prides himself in healthy eating and exercising religiously. I couldn’t believe that there was an “unhealthy” snack in our house. As I grabbed a brownie, my dad stopped me. I knew it was too good to be true! He was right, I couldn’t figure it out. It turns out the eggs and oil found in traditional brownies was replaced by a can of black beans. My dad’s addiction to finding healthy spins on traditional recipes didn’t stop there. It’s sort of become an ongoing joke at family get togethers, as we all laugh and try to guess what mystery ingredient is in his new healthy dessert recipe. In honor of my dad and his healthy treats, I’m sharing a few of his favorite healthy dessert recipes. No worries sweet toothers, you can enjoy these delicious desserts without the guilt. The recipe that I mentioned before is extremely easy to prepare. First, purchase a box of brownie mix. Next, add a one pound can of unseasoned black beans (undrained) to the brownie mix. Blend well without adding any other ingredients. Bake at 350° for 30 minutes or until firm. Then enjoy! This recipe makes an entire cheesecake for only 1,000 calories, compared to just one slice of cheesecake that typically has more than 500 calories. For even fewer calories, you can line a metal pan with parchment paper instead of using crust. You can also double the following recipe to make 2 large cheesecakes. Your family will be surprised to find out this cheesecake just doesn’t taste great, but it’s healthy too. Combine ingredients and use a mixer until smooth. Make sure to scrape sides the bowl as you mix. Pour mixture into a prepared graham cracker crust (large size) and bake at 350° for 30 minutes. After, reduce oven to 250° and continue baking for 50 more minutes. Chill overnight before enjoying. I found this recipe on Pinterest last week and I can hardly wait to try a healthy rendition of one of my favorite desserts, Puppy Chow! One cup only contains 100 calories, rather than approximately 365 calories per cup in a standard recipe. Melt the butter, natural creamy peanut butter and chocolate almond bark in large mixing bowl over the stove. After, pour mixture over the Fiber One Honey Squares. Let the mixture cool for about 20 minutes. After mixture has hardened, pour into a large Ziploc bag, add box of pudding mix and shake gently. I also recently found a website containing healthy baking substitutes. Here is a list of normal ingredients used in baking that can be substituted to make any dessert a little healthier. Begin substituting and enjoy your desserts! What are your favorite healthy dessert recipes? thank you so much for this amazing page and information. I live in Michigan but I shared this for a friend in Texas and anyone else that was interested. Again…..thank you so so much!